For years she had been the face and voice of Hooverphonic. But three years ago Geike Arnaert left this confident environment to pursue a solo career. Hooverphonic found a new singer in Noémie Wolfs and a year ago released the first album without Arnaert. Striking enough this turned into the most successful album for them so far. 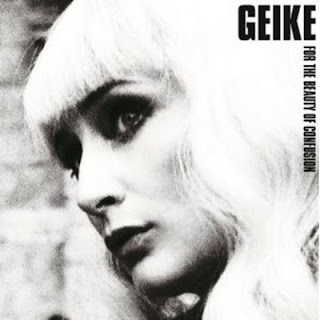 And now she's releasing her own debut album For The Beauty Of Confusion, simply as Geike. Hooverphonic changed their sound the last few years. The dark, mostly trip-hop songs, similar to Portishead and Massive Attack, were replaced with more pop/rock songs. Maybe that was the reason for the break, since Geike stays closer to the old Hooverphonic sound. It's impossible not to compare the two. She does give it her own twist. The songs are less dark and sometimes have a more "poppy" sound. Her somewhat pinched, strong, in some parts even powerful voice seems to sound lighter now and then. The variation in songs is giving her the opportunity to showcase what's she's capable of. The impressive album opener 'In Gold' still is a typical trip-hop song, but in the song after that, 'Icy', another Geike already can be heard. It's a pleasant pop song, that reminds of Tori Amos. The beautiful '107 Windows' could easily have been written by Amos. Halfway the record we find 'Smile', a nice lingering song, which is one of the highlights. To the end of the record there are more slower songs, that aren't all great. The album loses energy there and is sagging a bit. The mediocre rocker 'This Page' also isn't the closer that the record deserves. In general it's a good debut. It's clear Geike took the time for this album. The production is nice and clean and lots of attention went into the arrangements. She's showing what a wonderful singer she is. It may have been a shock when she announced her parting, but this way it results in an additional choice next to her old band. The Hooverphonic fans, that don't like the new direction, may recognize some of their old love in For The Beauty Of Confusion. Listen to 'For The Beauty Of Confusion' on Spotify.